The coolest pumpkin face painting ideas are here for you to look at also get some free face painting ideas. I'm sure I don't have to tell you how much FUN kids have with these kind of toddler activities. Take a look at this face painting example below and see what you think. The easy step by step face painting pictures with easy face painting instructions below show you how to create this simple face painting design for yourself. 1. 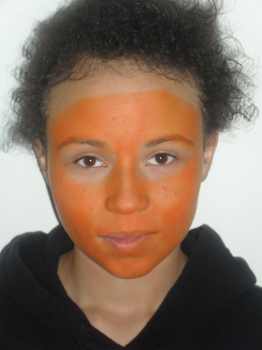 To start cover the face with a base of bright orange paint as in the picture. Making sure you get an even spread of paint. Using a paint sponge is the best way to do this. 2. Next using black paint create a triangle around each eye as in the picture. Then with the eyes shut fill in the triangles with more black paint. Next Paint the tip of the nose in black again. create a trianglke shape to go with the eyes. 3. Finally using the black paint again. Create a zig zag effect by painting small triangles and again and filling in with more black. 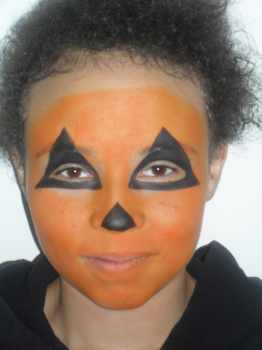 There you have it a very simple but effective halloween face painting design for you to try at home. 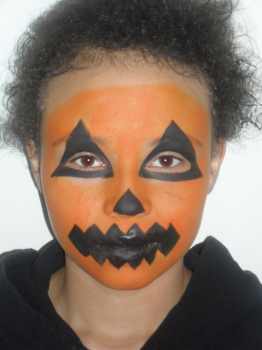 You can print of a pumpkin face painting template here as a pdf. It saves having to print the whole of this webpage. It just shows the step by step photos and the how to instructions (saves your ink). If your looking for more face painting ideas then this video below shows you how to face paint a pumpkin. If the video doesn't play properly then press the pause button for a minute or two. This will allow it to load then press play to watch. P.S. Making this into a face painting party would be a really great way to create a party they won't forget in a hurry. It's one of those really special toddler activities that kids and adults love so much. Still looking for some EASY face painting tips and advice ? Want an easy step by step guide with pictures to follow ? Want 100 designs of all kinds to choose from ? Don't want to have to spend forever learning how to paint beautiful designs ? Then Click Here! and learn how you could be painting faces within a day.